Juicing has become very popular in recent years and the market is expanding quickly. We all know that we need to eat fruit and vegetables daily and juicing is a good way to ensure we do this, especially if your worst nightmare is the idea of a plate full of greens. Imagine how tasty and refreshing a fresh juice is and then factor in all the nutrients you could be benefiting your body with. It’s a no brainer! Of course, if you’re new to the juicing movement and want to try it yourself at home, you’re going to need the right equipment. Twin gear juicers are some of the most popular and effective machines on the market. However, with so many different twin gear juicers to choose from, making the right choice can become confusing. So, what’s the best twin gear juicer? Read on to find out. 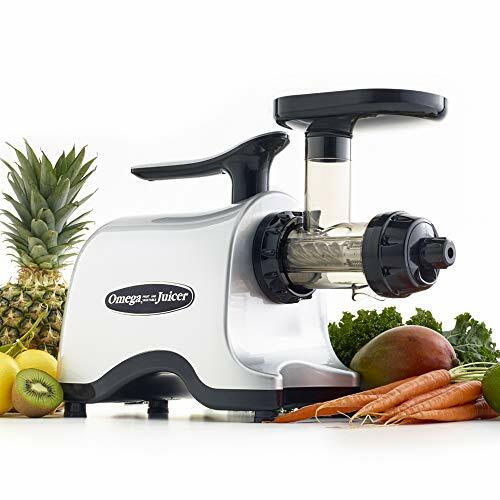 A twin gear juicer is also known as a triturating juicer which means it rubs, grinds and crushes the fruit and vegetable to extract the juice. A twin gear juicer has two gears which rotate inwards and are small in diameter. This is why they seem to spin faster. A twin gear juicer works at 80 – 160 RPM. Twin gear juicers work at a slower speed than other juicers like centrifugal or single gear, therefore less air gets into the juice. They are bigger and heavier than other types of juicing machines which also can be beneficial as they are less likely to move around. Who Could Benefit From a Twin Gear Juicer? People who are serious about juicing will benefit from these high quality machines. Those that like to juice daily need a machine that can handle a serious juice load and last for many years to come. People can consume more fruit and vegetables in a juice than they would consume by eating single portions. Juicing is a great way to increase your fruit and vegetable intake to the recommended seven a day. It’s also an especially great way to get kids to drink fresh juice and vegetables. They’re more likely to try a wider variety of fruit and vegetable when it comes in juice form. Juices are easily digested and absorbed by the body to provide us with the quality nutrition we need. Juicing has many health benefits. It all depends on the ingredients. For example Ginger can help with seasickness, morning sickness and nausea. What Are the Advantages of a Twin Gear Juicer? The end product from a twin gear juicer contains less pulp than other machines. Therefore, you can get a larger volume of nutritious vegetables in your juice. Twin gear juicers are able to juice many different types of produce, from green leafy vegetables to fibrous vegetables, grasses such as barley or wheat as well as fruit. The low speed motor creates less oxidation which means the enzymes are better preserved. This means juices can be store in the fridge for approximately 48 – 72 hours. The juice remains fresh and stable. Another great feature is that the motor is quiet and the machine is robust and less likely to move around although it does take up more space in your kitchen. Some twin gear machines can be used to make pasta, ice cream, sauces and and baby foods which could help you as an all round kitchen gadget instead of needing numerous electrical appliances. Twin gear juicers are not good at juicing citrus fruits. They are slower than other types of juicers. Cleaning a twin gear juicer can take longer than other types as it has more parts to clean. The produce often needs to be cut into smaller pieces which takes more time than when using other types of juicer. Some juicers have an adjustable knob that allows you to vary the back pressure. If the back pressure is increased this will squeeze the produce better and provide a better yield, but may make it tougher to push the produce through. You should also consider which machines allow you to put through soft fruit and fibrous produce. It you like ground coffee from beans, some machines are able to grind beans. Check to see that the juicer you’re interested in comes with the attachments you require. Having to buy them as an extra means spending more. Remember, we will all use the juicers differently and certain attachments will be unnecessary for some so this is wasting money. Not all of us will all use the pasta maker! Another thing to take into consideration is how long it will last. Buying a twin gear juicer is not like buying food, we want it to last for a long time. You don’t want to buy a twin gear juicer and then have to replace it in a year as it is not working properly. Do some research find out where it was manufactured and check to see that quality parts are used. Also check the warranty details for the product. Most reputable companies will give at least five years and some give between 10 – 12 years. 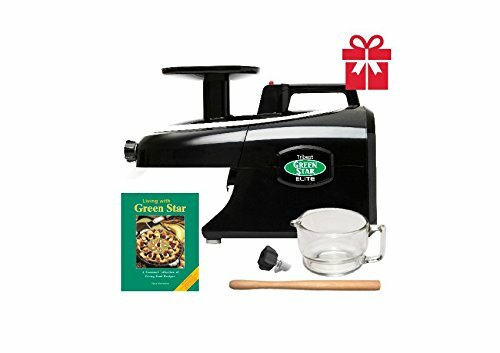 What Is the Best Twin Gear Juicer? With so many products on the market it can be difficult to know which one will suit your needs best. I have done the research for you and come up with my top five picks for the best twin gear juicers on the market today. This is one of the higher priced twin gear juicers but comes with a 12 year warranty which should give you peace of mind. It has a pressure adjustment knob which you can use while juicing. The gears are made from stainless steel. It gives a better juice yield and makes smooth juices. The low rotation speed it means juice lasts longer in the fridge. It can make make sorbets, nut butters and prepare baby foods so is multi functional. It comes with four different screens: the fine screen, the coarse screen, the homogenizing blank for basic food processing and the breadstick maker set. Some users had the slight complaint that they have to cut harder vegetables smaller and push them into the chute. It is also one of the larger machines so more space is required. 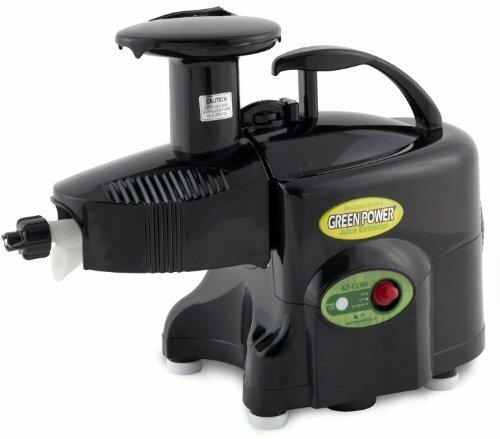 This product from Green Power is a smaller machine making it great for anyone with small kitchen space. With its bio ceramic and magnetic technology combined with the low rotation speed juices will be more nutritious and last longer. Less heat is generated which helps prevent damage to the enzymes and nutrients. It is middle of the road in terms of price so could be good for anyone on a limited budget. It has an outlet adjusting knob with spring tension. Pressure is created to squeeze all the juice from the pulp therefore you get more juice from your produce. It comes with two juice screens which allow for the adjustment of pulp levels. Some users found it difficult to juice carrots and had to push them down. This is a slightly higher priced machine. It is a low speed, quiet, heavy duty twin gear press system that works with minimal heat and friction to preserve delicate nutrients. It comes with a number of extras including a fine screen, glass juice pitcher, cleaning brush, plastic and wooden plungers, coarse screen, drip tray, strainer, breadstick maker set and pasta maker set. The only problem some users had was that they found it difficult to juice certain fruits and vegetables. Deluxe set of juicing and food processing attachments. Automatic pulp ejection for continuous juicing and easier clean up. Two pasta settings for fettuccini and spaghetti. This is the highest priced twin gear juicer but it does come with a special package of extras. It has a 12 year warranty to give you peace of mind that to justify the high price tag, it should go the distance. It produces a good yield so you can get the maximum amount of nutrition from your produce. This product is sleek and black to compliment any kitchen. One downside some users found is that this product takes a long time to clean. wooden plunger and soft fruit adjusting knob. Portable with balanced sure grip handle for easy carrying. Also grinds nuts and grains. 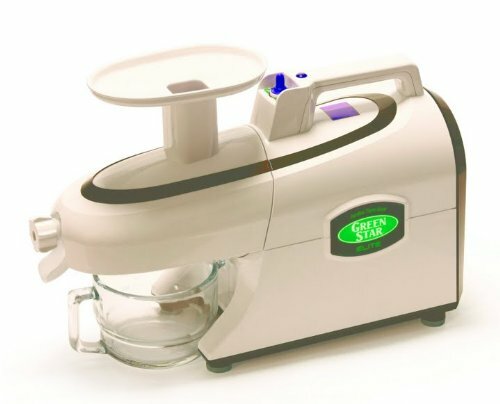 The title of best twin gear juicer for me has to go to the Tribest Green Star Elite GSE 5000 jumbo twin gear cold press juice extractor. I think it has almost everything you need in a juicer (and more!). It does come at a higher price which might not suit every budget, however, the 12 year warranty offers peace of mind in terms of the quality you’re buying and means you can juice for the entire family for years to come – perfect for the serious juicers out there. This seems to me to be a good all round kitchen gadget, with the ability to work as a food mill, prepping everything from baby food to nut butters. 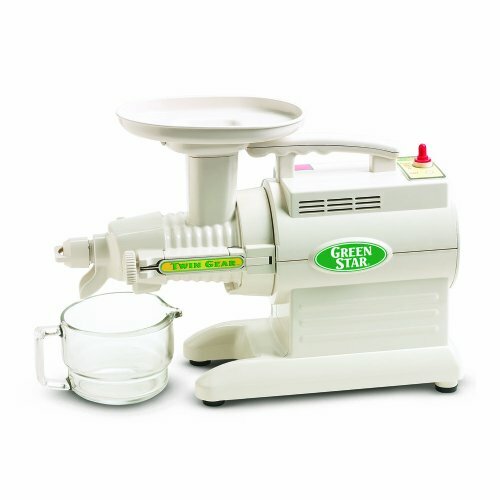 Therefore I think this is a great choice for anyone looking to get the most out of a twin gear juicer.